Starbucks (NASDAQ: SBUX) ended FY 2018 strongly after reporting Q4 results of $6.3 billion at 11% year on year (YOY) growth and 3% YOY growth in comparable store sales. These were driven by 8% YOY Net revenue increase in the Americas, 41% YOY in China / Asia Pacific segment, 5% YOY in EMEA, while there was a 6% YOY decrease in the Other segment primarily driven by the licensing deal with Nestlé. For the coming two years the expected overall revenue growth is expected to continue from the increasing number of stores, comparable sales growth, and increase in transactions. Going forward, we expect Starbucks’ revenue to increase by about 14% (overall) from the year 2018 to the year 2020. To arrive at our 2020 net revenue estimates for the company, we have broken down the revenue streams and estimated them separately. 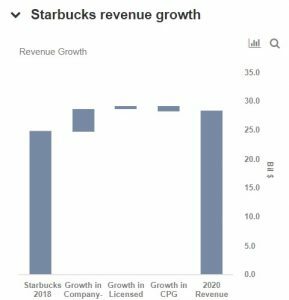 We have also created an interactive dashboard on How Much Is Starbucks’ Revenue Likely To Grow Through 2020? 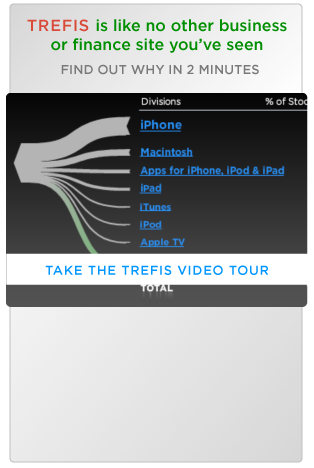 You can make changes to these variables to arrive at your own revenue estimates for the company. 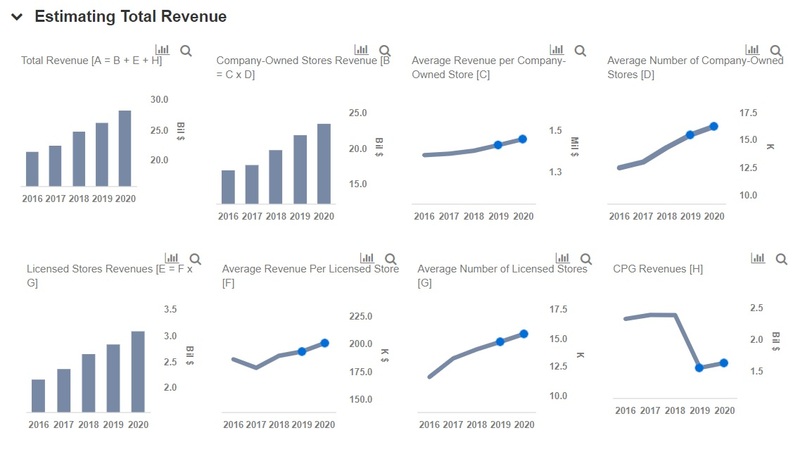 Looking at the year 2020 we expect Starbucks to generate around $28.17 billion, with the company owned stores segment leading the way with approximately $23.5 billion in revenue, followed by the Licensed stores segment expected to contribute about $3 billion in revenue, and the CPG segment about $1.6 billion. The deal with Nestlé is expected to start reaping benefits a couple of years down the line and thus the CPG segment is expected to fall by approximately $755 million in the next couple of years. Visualize Related Companies: Starbucks , Chipotle , Dunkin' Brands , McDonald's , Restaurant Brands International Inc.